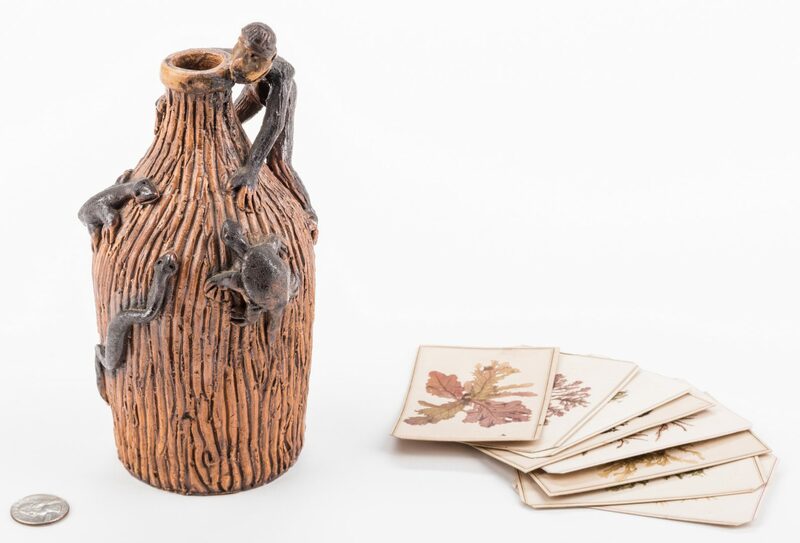 Temperance jug, with thin brown glaze over light colored clay. 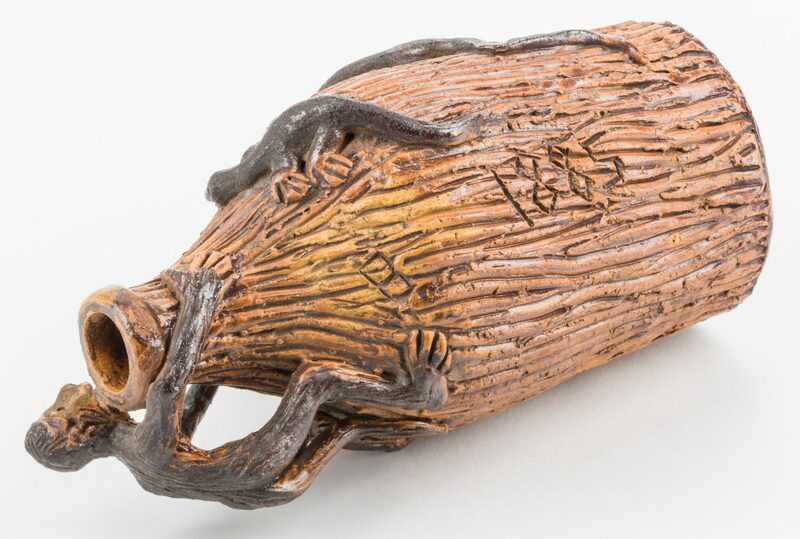 Jug is incised to give the appearance of bark. 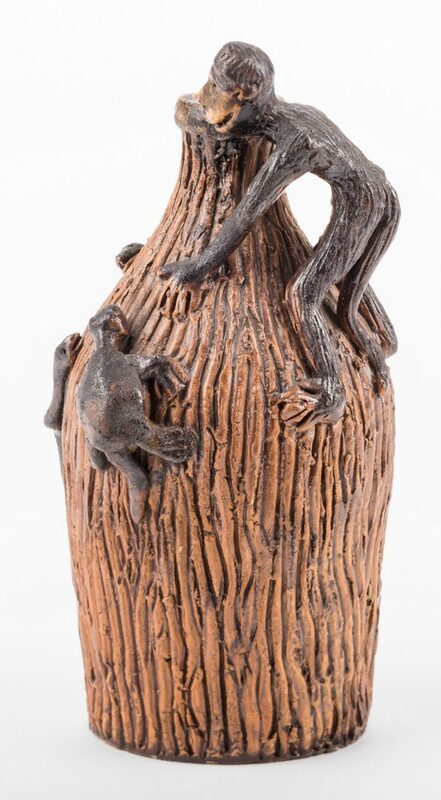 Four dark brown animal forms are applied to the jug. The largest is a monkey which serves as a handle. 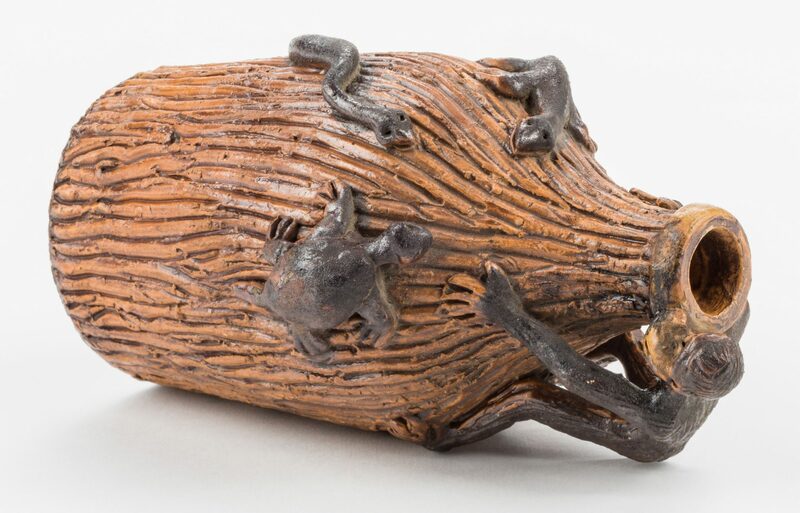 A lizard, snake, and turtle are neatly placed on the other side facing the monkey. 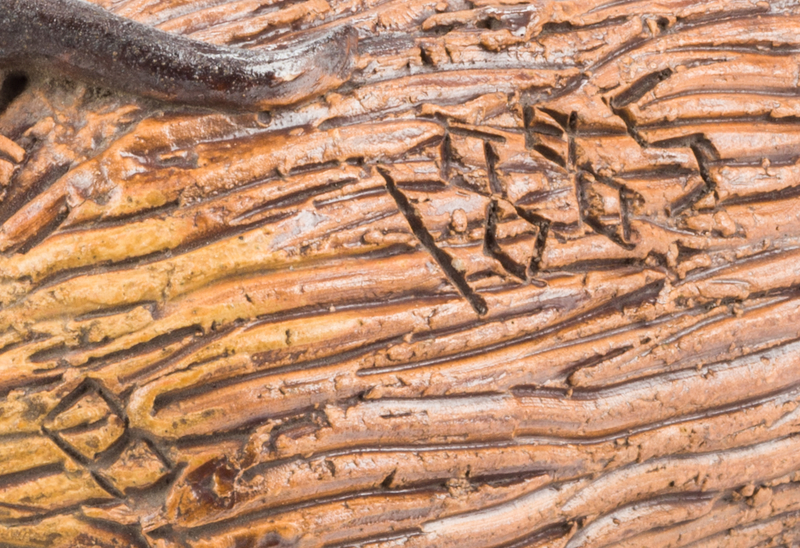 A large “B” and “1885” are incised vertically between the monkey and the lizard. 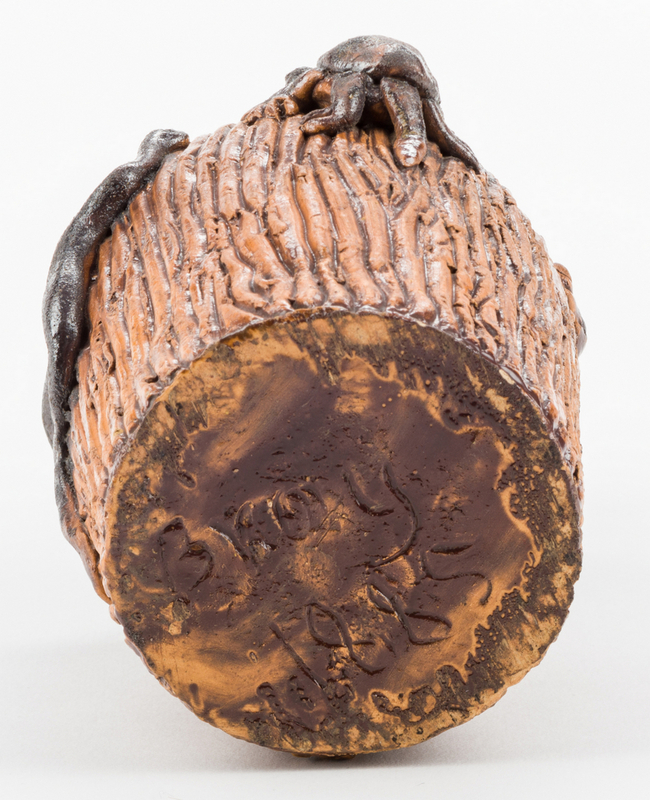 “Bray” and “1885” are incised on the glaze covered bottom. 7 3/4″ high. The jug is attributed to Simeon Lewis Bray (1849-1914). He was born in Massachusetts, however, before he was a year old, the family was in Wisconsin, where they remained through 1855. By the 1860 census, they were in Anna, Union County, Illinois. This lot also includes 9 homemade seaweed calling cards. 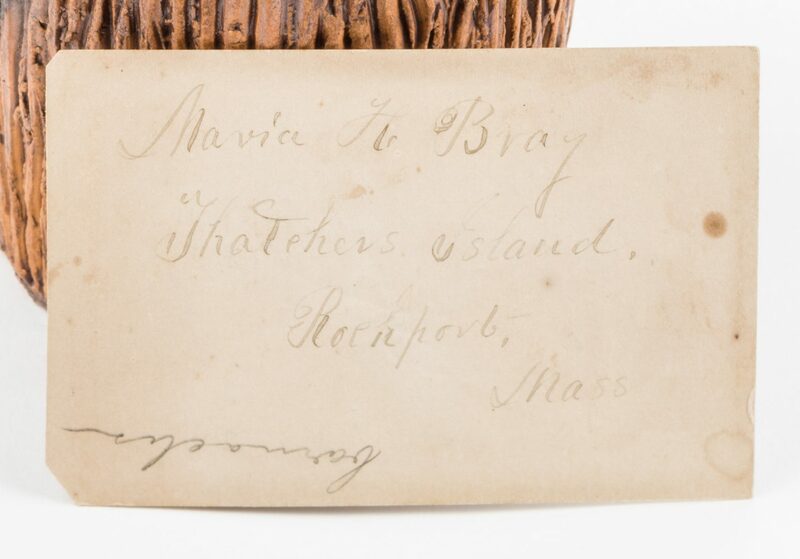 One has Maria H. Bray, Thatcher’s Island, Rockport, Mass on the back. Description, history and biography (Courtesy of Carole Wahler): The Kirkpatrick family established the Anna Pottery in 1859. Simeon’s occupation was listed as Turner in pottery and he was living 12 households from Wallace Kirkpatrick in 1870. 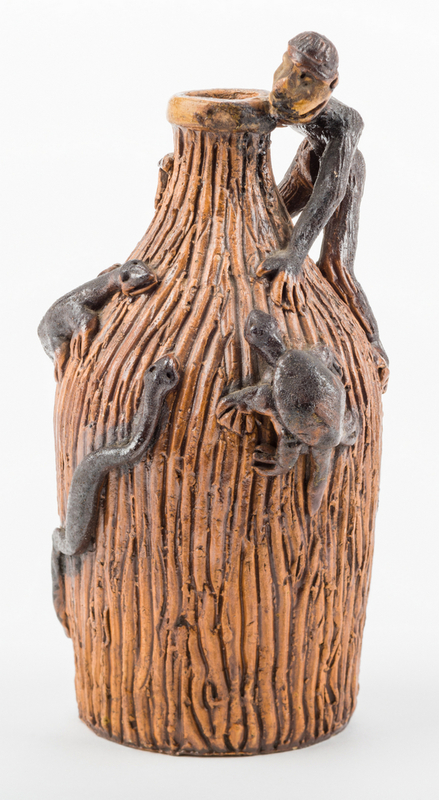 Wallace was producing his now famous snake jugs during the 1870s and 1880s. These jugs reflected his interests in the temperance movement and wildlife, especially snakes, which he collected. Simeon married in 1876 in Evansville, Indiana and remained in the area until at least 1901 when he registered his second patent related to pottery production. 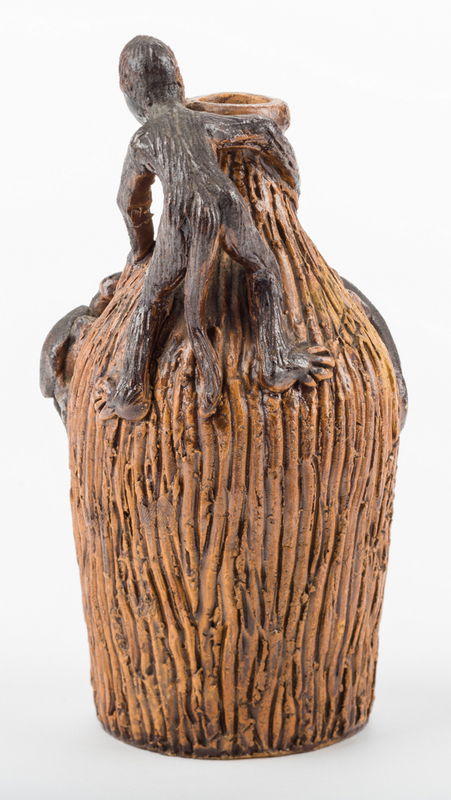 By 1910 he was located in St. Louis City, Missouri still working as a potter. Simeon died there in 1914 but was buried in Evansville. He had two younger brothers, James W. and William F., who were also potters. 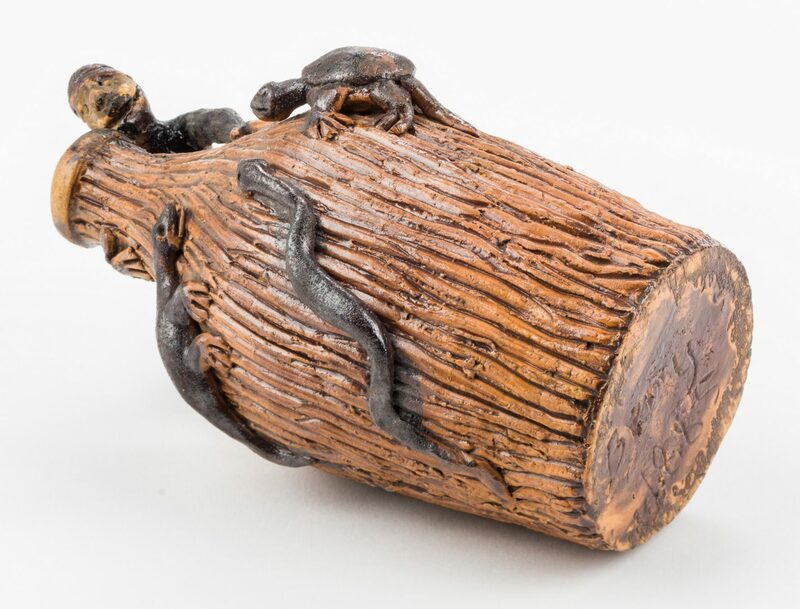 Initially, it was theorized that James W. was the maker of this jug. Support for this notion was drawn from the 1880 Metropolis, Massac County, Illinois census where his occupation was listed as Clay Artist. At the time, he was working at a pottery which was originally established by John Kirkpatrick and one of his brothers-in-law. 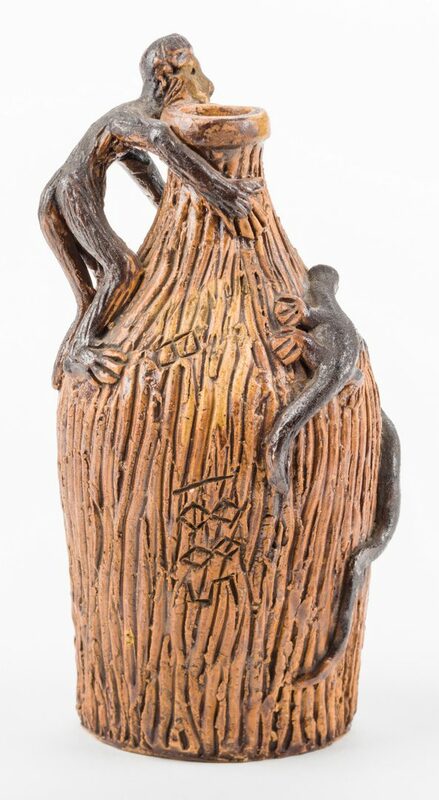 More support for the attribution resulted from discovering the existence of a temperance snake jug signed by J. W. Bray. Another very similar jug incised 1886 is attributed to him. 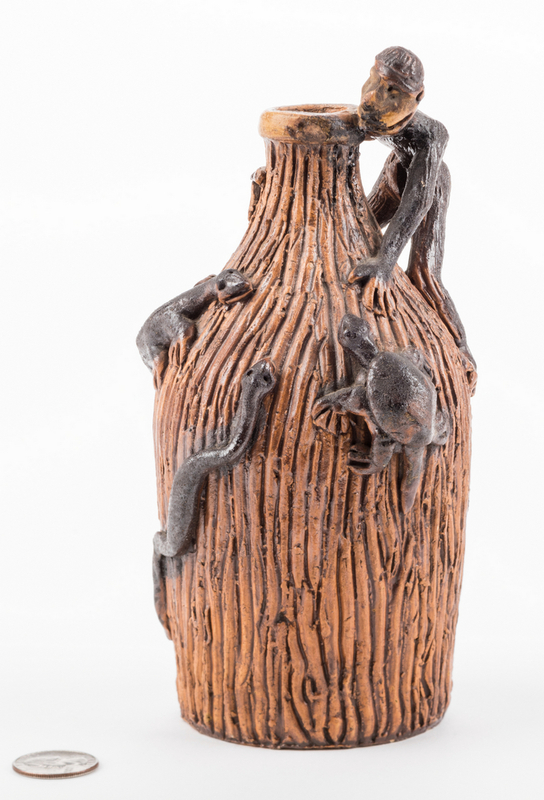 However, the timely listing of a temperance jug by Schmidt’s Antiques in Michigan persuaded us of the error of our thinking (see https://www.liveauctioneers.com/item/52092487_stoneware-temperance-snake-jug). 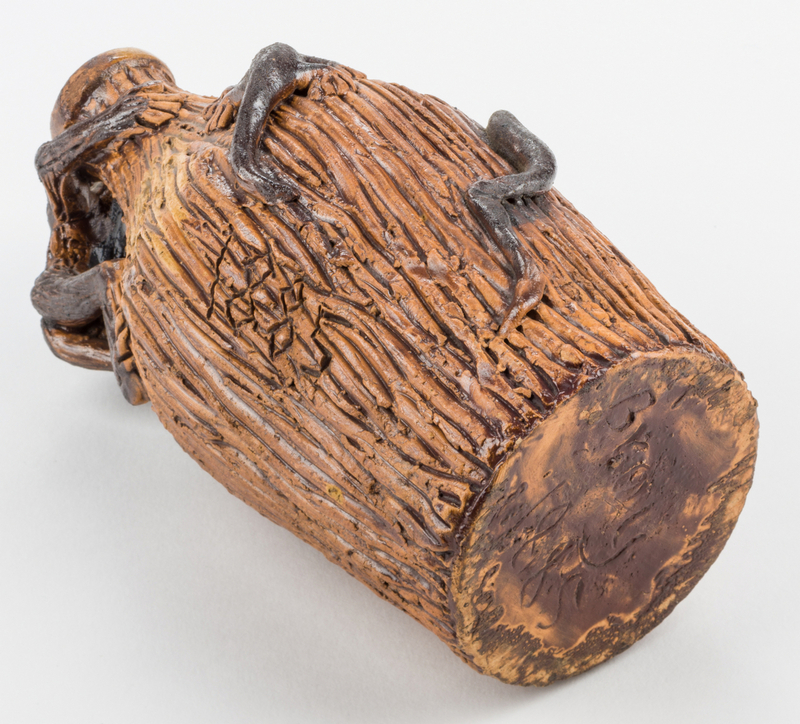 The Schmidt jug is of similar size, clay color, glaze and decoration. 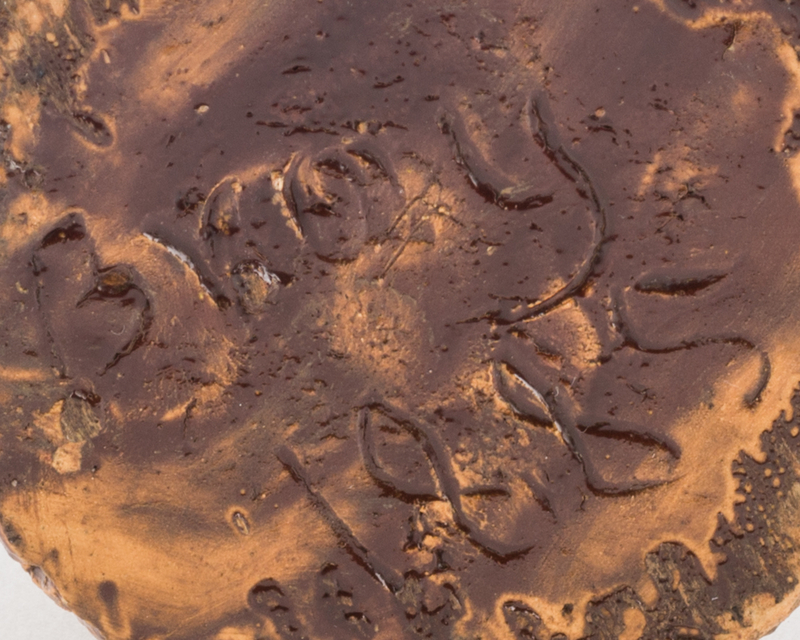 It is overall qualitatively very similar and incised S L B and 1885 on the bottom. It provides the greatest support for the Simeon Lewis Bray attribution. 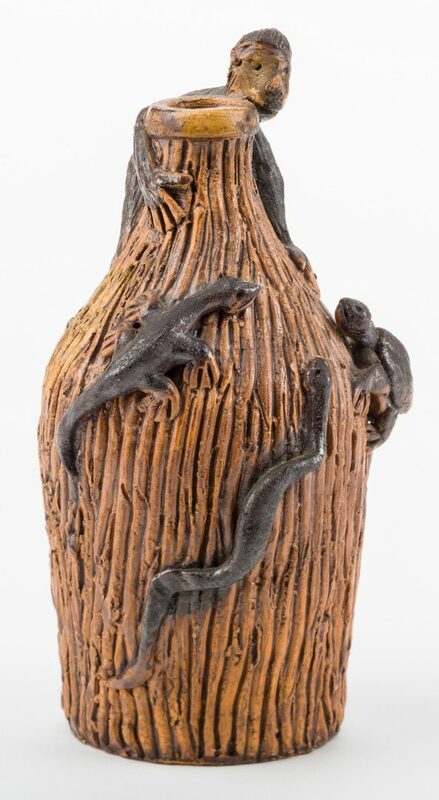 The two J. W. Bray jugs are visually quite different from the two Bray 1885 jugs; and both the J. W. Bray jugs and the Bray 1885 jugs are different from Wallace Kirkpatrick’s realistic snake jugs. 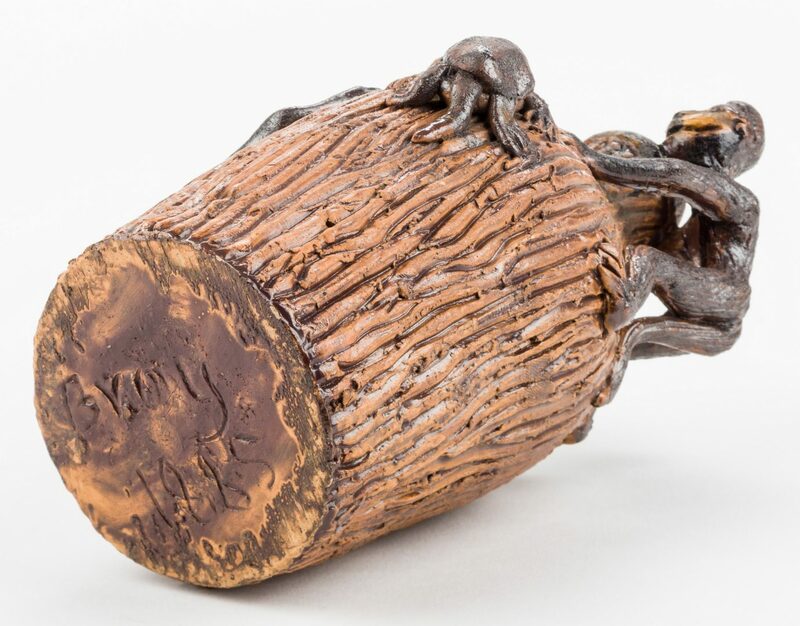 The Bray jugs have more of a folk art quality to them. An unsuccessful attempt was made to connect the Bray families that are associated with the seaweed calling cards to Simeon’s family. No guesses were formed as to how they came to be with the jug. Maria’s husband’s family and her mother’s Bray side of the family were in the United States long before Simeon’s family arrived. Maria was a remarkable woman and an enthusiastic supporter of the temperance movement (see http://www.nelights.com/blog/tag/maria-bray/). IMPORTANT UPDATE: Simeon Bray was in Huntingburg, Indiana at least during the early months of 1885 according to information provided by Brian Moore of Indianapolis. Additional communication with him suggests it may be more difficult to discriminate between pottery made by JWB and SLB than originally thought. Research continues. cw CONDITION: Overall excellent condition.